Sometimes having straight, symmetrical, healthy teeth is not enough. People who have gum tissue that extends too far down have what is called a “gummy” smile. Whether it has been caused by genetics, periodontal disease, bone deterioration, or the use of certain blood pressure medications, a gummy smile can cause people to feel self-conscious about their appearance. 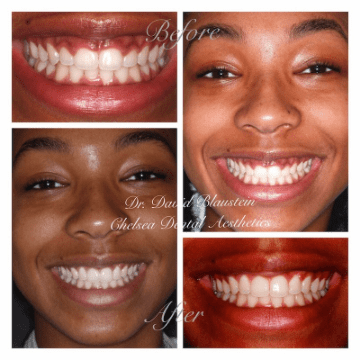 Fortunately, Dr. Blaustein and the staff at Chelsea Dental Aesthetics offer a cosmetic dentistry procedure called gum contouring, which uses gentle lasers and specialized tools to remedy this common issue. Do you just cut the gums? During the procedure, called “gum contouring”, we remove excess tissue to enhance aesthetics of the smile. Do the gums grow back? No – Because the bone just under the gums is contoured as well, the gums won’t grow back. No – the area will be completely numb throughout the procedure. Will I be sore afterward? Some patients experience some soreness when the numbness wears off. However, usually, an over-the-counter pain-relief medication is all that is needed to relieve discomfort. As surprising as it sounds, many celebrities have had gum contouring done to perfect their smiles, including Miley Cyrus, Catherine Zeta Jones, and Kate Beckinsale. Yet, one need not be rich and famous to take advantage of laser gum reshaping. Anyone with anxiety, embarrassment, or unhappiness related to an imperfect smile may benefit from cosmetic dentistry like gum contouring. Patients do not need to take any time off work, but may experience some soreness or swelling for up to a week. Over-the-counter painkillers like ibuprofen is often all that is needed. For the first few days following the procedure, patients should stick to soft foods like yogurt, cottage cheese, ice cream, Jello, eggs, pasta, and cooked vegetables – and avoid anything seedy or spicy. Dr. Blaustein will discuss the protocol for mouth rinsing, flossing, and brushing at the initial consultation. These issues are temporary in nature and can be treated by a dental professional quickly and easily. However, patients are still encouraged to be forthcoming and disclose their full medical history at the consultation, so Dr. Blaustein can identify any possible risk factors and take additional steps to minimize complications. The cost of the procedure varies based on the patient’s condition and the amount of tissue treated. Generally dental insurance benefits do not cover this cosmetic procedure. If you’re looking to explore gum contouring in Manhattan, call to schedule a consultation with Dr. Blaustein and his team, to discuss the possibilities and the affordable financial options to make it happen! Dr. Blaustein of Chelsea Dental Aesthetics specializes in cosmetic dentistry, and incorporates gum contouring to help reshape smiles. As a nationally recognized expert in cosmetic dentistry, Dr. Blaustein maintains a membership with the American Academy of Cosmetic Dentistry and adheres to the highest industry standards. He is certified by New York State to administer sedation and has served as a mentor to post-graduate students. His friendly demeanor and professionalism makes patients feel at ease when they come to his office. “They make going to the dentist a peaceful and relaxed affair.” – Adrian B. “David Blaustein is an artist.” – Joan S.
“Everyone from the receptionist and hygienist to the dentist seemed concerned with me.” – Carole G.
Get a bigger, bolder, brighter smile without delay! The compassionate staff at Chelsea Dental Aesthetics awaits your call. Just phone London Terrace Phone Number212-243-6081 to schedule a consultation at Dr. Blaustein’s Manhattan cosmetic dentistry practice.